Mangalore University Result 2018 - 2019: The student of Mangalore University can view the 1st, 3rd, 5th Semester UG / PG results NOV - DEC 2018 at www.mangaloreuniversity.ac.in. The University has released several examination results for the examination conducted in the month of Nov - Dec 2018. You can find the direct link from this page as mentioned below to check Mangalore University Result 2019 Degree Examination 1st, 3rd, 5th & 2nd, 4th, 6th Semesters. Dear student, if you are searching for Mangalore University results for the examination conducted earlier by the university then visit the main website result's page. In the Mangalore University results declaration page, all the courses name are available which results have been announced. Some of UG and PG Exam Results are as follows - Bachelor of Computer Application (BCA), B.Sc, B.A., and M.Sc in a different discipline. 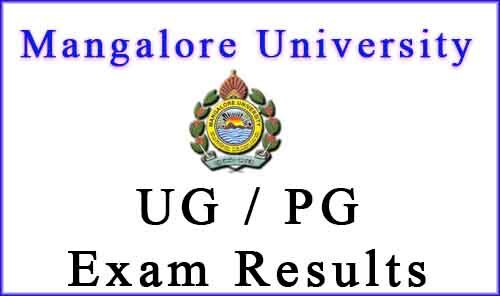 Please check your own results by login at university website (mangaloreuniversity.ac.in) or http://52.77.88.220:3331/. The Mangalore University Results for Nov - Dec 2017 Examination can be checked by using Registration number of student. Now the students of UG / PG Degree courses of Mangalore University can check their semester examination results of BA, BSc, BCom, BCA, BHM, BHS, BSc (FD/IDD), BBM, BBA, BSc (FND), BASLP, BSW and BA (HRD), M.Sc courses. Those students who have appeared in even semester exams conducted by the university can check own marks at http://52.77.88.220:3331/. If you are unable to find the results link of your examination, then you may follow the below-given steps to get the same easily. If you can not satisfied with the results can apply for revaluation result which will be declared by the university after some time. First of all, you must reach the main web portal of the university i.e. www.mangaloreuniversity.ac.in. Now, Search for the relevant link under "Academics" which is given in the bottom of the homepage. Click on the latest published link " Nov / Dec 2018 Exam Results". A new page will be open showing various course name and ask for your Registration Number. You just put your "Registration Number" and hit the link "Check Result". A page will appear on your screen including details of marks. After verifying your marks via online mode, take a print copy of same for further uses. Students must obtain the original of Marks Statement from their colleges. The university sends the marks sheet of the exam results to its affiliated colleges within a month. Students waiting for May - June (UG / PG ) Exam Results need to check the latest notification at the official website. Here we will provide all relevant updates for your after getting any updates from the Mangalore University's website. Update: Mangalore University Nov - Dec 2018 Exam Results will be announced. Students can check 1st, 3rd, 5th, Semester Results @ http://52.77.88.220:3331/. About University: The Mangalore University (MU) is a public state university located in Konaje, Karnataka, India. The university provides excellent academic, Physical, Administrative, infrastructural and Moral ambiance. It promotes quality and excellence in Teaching Learning and Research. The campus of the university is located at Mangalagangothri about 20 km to the south-east of the historic coastal town of Mangalore. The university has 190 affiliated colleges including 2 constituent colleges. It offers various Under Graduate and Post Graduate program. From January 2008, it had 25 PG Departments on the campus, 2 constituent colleges, four Law, 13 education, five autonomous & 119 affiliated colleges / Institutions. The Mangalore University is the first university in the country which started Bachelor's degree programs in Hotel Management & Tourism, Fashion Design, Apparel/Garment Design, Leather & Technology and Human Resource Development and PG programs in Computer Software and Yogic Science. For more details about Mangalore University, Please visit the official website or Wikipedia.